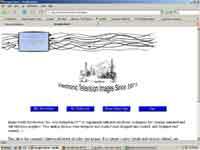 Clicking on a website picture will take you to the actual site. These will open in a new window, so that you won't lose me. Please remember to close the new browser window when you have finished looking at the other sites. 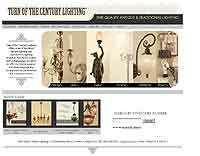 Turn of the Century Lighting is a client- maintained site that serves as an ongoing catalog of antique and custom-made lighting fixtures. I designed the site, and set up a digital photography studio to photograph the beautiful reflective brass fixtures. The lamps are all cataloged using php and mySql. I created the Disappearing Propeller Boat site, because I have one. Don't forget to read some of the stories. This one's maintained by me. 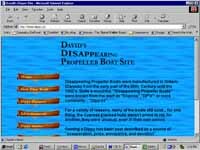 The DOA registry is an online database of all known Disappearing Propeller Boats. It is all php and mySql driven. As of Spring 2014, there are only 50 boats listed, with another 100 or so yet to come. Image North Production's historical video site. Another one of mine. This is a learning experience with embedded YouTube. 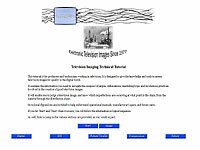 New Television Training from 1954 to MPEG artifacts.